By refusing to repeat the device and make it into an integrated stylistic mannerism, the movie just throws it out there as yet another quirk in a film full of them: physical quirks, acting quirks, narrative quirks, dialogue quirks. The lone intertitle is like the film’s lone “supernatural” intervention (“How she got that way we’ll never know. Some say a jealous lover -” HUH? “Others, that it was the Code of the freaks” Sure, but HOW? “Others, the storm…” WHAWHOWHAWHUH??? ), an unsettling disruption in a film that makes uneasiness an aesthetic. 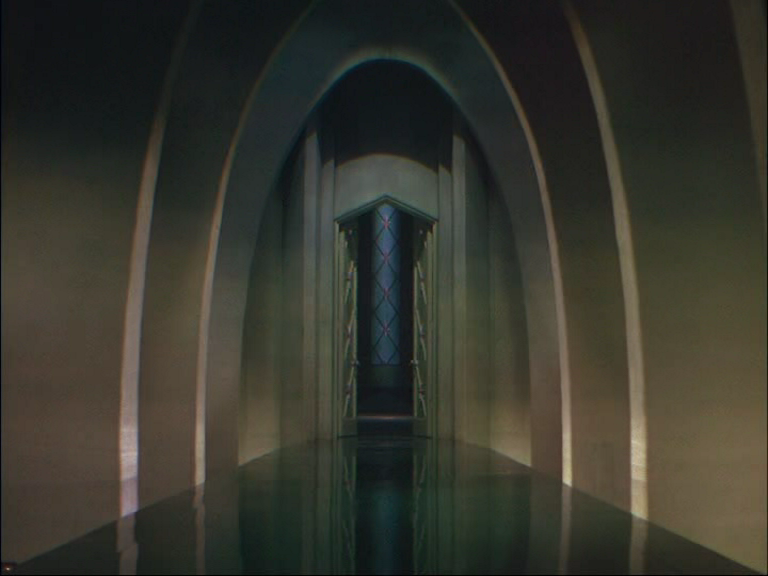 Not only is this shot beautiful in itself (for sheer architecture I’ll take it over the last shot of THE SEARCHERS), it demonstrates conclusively that all stars of films in a 1:1.33 ratio should be shaped like Harry and Daisy Earles. Early stuff I read about FREAKS suggested that it was a clunky, awkward film, but although it’s been much hacked-about (censored or at least heavily pruned), it’s full of strong visual ideas and sequences. For an early-ish talkie, it’s far from static. Much of the camera movement centres on the character played by Johnny Eck, the Man With Half a Body. Browning was smart enough to realize that the particular condition suffered by Eck (real name Echkardt, making him also the Man with Half a Name) was one that necessitated showing him in motion. Otherwise he would look like a special effect, like Cleopatra the Chicken Lady. We simply wouldn’t believe what we were seeing. The visual high points of the film are the above-mentioned Wedding Feast, and the climax. The feast features not only a commanding sound mix, with the circus performers’ chanting running under the dialogue, building to a crescendo, but effective use of angles looking directly at the singing sideshow people, while they look right back at us. Browning as Ozu. Some of these shots are linked by fast pans, although sadly insensitive editing has slashed many of these while leaving trailing fragments of a few frames. Another great shot is the one where Angelo Rossitto, seemingly the leader of the troupe, walks across the banquet table from one side to another, carrying the loving cup for the guests to drink from. As he does so, the camera also crosses the table, but in the opposite direction. It’s a strange effect I’ve noted, that when a character’s movement pulls the camera but in a different direction, so that they pass “like ships in the night,” the effect tends to make the character seem more powerful. As far as seems to be known, the character on the table has no actual medical malformity. She’s NORMAL. Prince Randian — prince of WHERE??? The main factor that accounts for FREAKS’ devaluing, I think, is the performances, particularly the handling of dialogue. The primitive quality of sound recording technology in 1932 conspires with the thick accents of many of the stars, and the uncertain delivery of some of them, to make FREAKS a strange film in ways not directly connected to its subject. Of course, the variety of accents results partly from Browning’s decision to cast the most astonishing people he could get. If they happened to be from Germany (Harry & Daisy, real-life siblings and part of a troupe called the Doll Family), Austria (Josephine Joseph) or British Guiana (Prince Randian, who has neither arms and legs and wriggles around in a big sock, and whose sole line, the mysterious “Can you do anything with your eyebrow?” really does require the DVD subtitles to understand), then so be it. In fact, by setting the story in France (for no obvious narrative reason) and populating the non-freak roles with an ear-defying jumble of accents, Browning makes a virtue of necessity, capitalizing on the punchy sensation induced by his characters’ varied physical appearances. FREAKS is a film that keeps you off-balance, unable to believe what you’re seeing or hearing. As acrobat and strongman, Olga Baclanova and Henry Victor’s respective Russian and German accents, debilitatingly thick, can also be accounted for by the fact that they’d been silent stars (see Olga in Sternberg’s DOCKS OF NEW YORK), but I prefer to see their casting as a deliberate assault on the audience. That climactic storm scene also shows Browning in top form, testing our affection for the freaks, built up during the story, by casting them as avenging demons, and allowing them to mirror the insult slung at them earlier by Cleo — “Dirty, slimy freaks!” They crawl through the mud like angry earthworms to get even with their enemies. Prince Randian clutches a blade between his teeth like a pirate, although what he intends to do with it should he catch up with his prey is unimaginable (but we’ve seen him light a cigarette with his mouth, so anything’s possible — maybe he can do something with his eyebrow…). Notably, in this scene Henry Victor transforms from possibly the world’s most grating ham — explosively bombastic and stilted, pointlessly loud and obnoxious even in his posture — into a very effective physical player, his body contorting to expressionist effect, his panic real and convincing. His sheer terror is the sole foreshadowing of the supernatural conclusion. It’s been suggested that Hercules was to have been glimpsed again in the penultimate scene, singing in a high voice, the strongman rendered castrato by the freaks. It’s also been suggested that a car crash that seriously injured Tod Browning earlier in his life (I’m not sure when — was he already a filmmaker, or still a circus performer himself, a contortionist and somnambulist billed as The Living Hypnotic Corpse? ), may have left him in the same unfortunate condition. Poetically, both these Kenneth Angeresque rumours somehow feel like they ought to be true.